These open for business flags help to alert customers to your business being ready for them to enter. The outdoor advertising banners are 1800 x 900mm, the perfect size for placement outside of shopping centres, retail stores, restaurants, cafes, and more in a window front, on a flagpole, or simply hung on the exterior of the building! Eyelets on each corner make placing this display in these locations easy as well. The open for business flags, like a feather flag or outdoor signs, utilises a red and white colour scheme to make seeing & reading the flag easy. 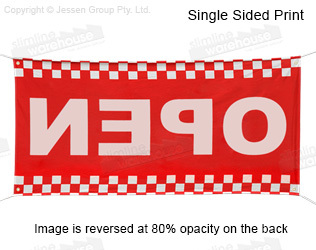 Red & white checkers line the top and bottom of the flag to help capture potential customer attention. 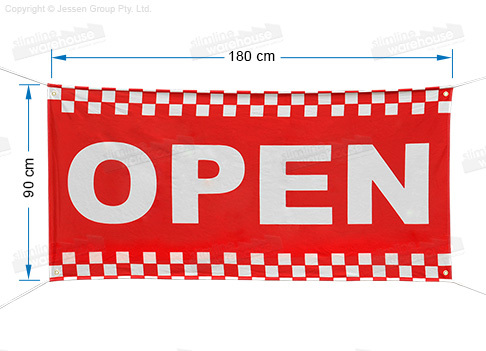 The word "OPEN" is shown in white against the red fabric on the polyester flag. Use the included 1.2m rope to easily place this display at your business to get customer attention.